Recently we working on a large size but non to scale project with a architect company from Malaysia.Everything is going smoothly, when the client ask us to add human figure into the scene, we are decide to use Populate tool which come with the Autodesk 3ds max software. 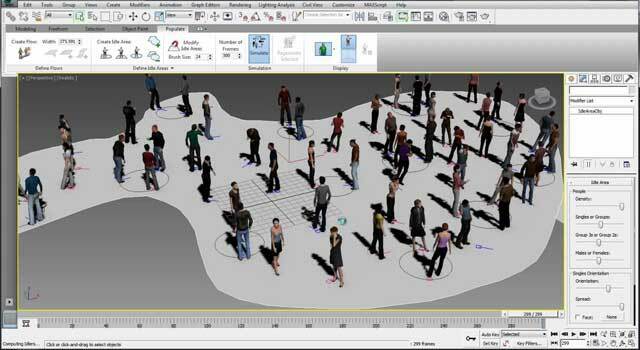 After we apply it into the scene, we discovered that this populate tool didn’t come with a scale button, all the human figure look too large in our not to scale scene. Luckily we found the solution from 3ds max help files, in maxscript type [ pop.realworldscale =1 or any value you want ], and then you have to click [ Simulate ] everytime after you run the script, it’s annoying, So we decide to write a simple script to simplify our work with one click. If you have any question about the script, please leave your message in the comments box or use the contact form to contact us. We might not be able to answer all the question, but we will try to answer as much as we could.